The “Holy Land” is a religious concept used by many groups to justify involvement in Israel, the Palestinian Territories and parts of Jordan and Lebanon. The Vatican supports a two-state policy which would remove Jerusalem from Israeli jurisdiction and has proposed an “internationally guaranteed statute” (a concordat?) which would remove religious sites from Israeli jurisdiction. 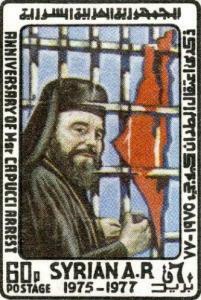 This Syrian stamp honours Archbishop Capucci of Caesarea, who was born in Syria. It shows a blood-red map of Israel impaled on the bars. In 1974 this Melkite Catholic priest was imprisoned by Israel for smuggling arms. He also features on stamps issued by Libya, Sudan, Egypt and Iraq. In Jerusalem, where the Church also has important land claims, there is another religious shift, as the secular Jews leave the city and the ultra-Orthodox "Haredim", identified by their black suits and hats, flock there to await the coming of the Messiah. The Haredim vote as a religious block, and thus their political weight is disproportionately great. They, of course, have their own theocratic agenda, and in 2011 began defacing advertisements in Jerusalem that showed women's faces. This has been seen as an attempt to force on the majority the practices of a minority of Israelis: the dress code of the rapidly-increasing number of ultra-Orthodox women who cover themselves, faces included, with veils called shalim. These are also called frumkas, from the Yiddish frum meaning pious. However, most people around the world would call them burqas. And then there is the issue of the decade-long negotiations on a financial settlement. This includes the ownership and tax status of religious sites and of leased Church land where many official Israeli buildings sit. Israel wants the Church to pay back taxes, while the Vatican argues it should be tax exempt. The Vatican also wants back Church properties expropriated in the past and a guarantee that this will not happen again. One of the properties that the Vatican would like to control is the Cenacle. This is a room in a Crusader-era building, on a site where Christians claim that the Last Supper was held. On one wall it has a carved stone niche pointing toward Mecca, dating from when it was an Ottoman mosque and beneath its lower floor the Jews believe King David is buried. (The building that was there at the time of Christ has been replaced several times and a biblical archaeologist even doubts that this long-vanished room was the site of either King David's tomb or the Last Supper, but no one can dispute the fact that the present building was indeed a mosque.) At religiously contentious sites like this Israel wishes to remain in a legal position to maintain public order. To some Israelis such pronouncements look like an attempt to loosen Israel's hold on the Holy Land by seeking Palestinian support, in a classic divide and conquer manoeuvre. The increasing religious polarisation in the Middle East, would seem to favour such a strategy. The Vatican's former foreign minister, Cardinal Jean-Louis Tauran, has even tried to widen the negotiations to include Muslim and Jewish religious sites, as well. This is reminiscent of the way the Vatican urges “religious freedom” laws for other faiths which, (as in Brazil), serves to neutralise their opposition to a concordat and pit the government against a much larger group. 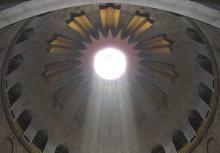 * First “box”: The the Church of the Holy Sepulchre is said to be one of the tombs of Jesus. There are others, like the one in Srinagar, Kashmir which is venerated by the Ahmadis. For the “spiritual defects” of other faiths, see The Congregation for the Doctrine of the Faith, “Responses to some questions regarding certain aspects of the doctrine on the Church”, 29 June 2007. 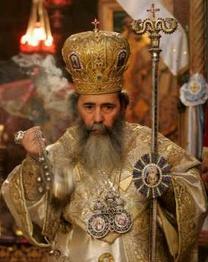 For the use of incense, see “The Franciscans at the Holy Sepulchre”, Franciscan Cyberspot, 26 December 2001. And for “Monks Brawl at Christian Holy Site in Jerusalem”, AP, New York Times, 9 November 2008, see the article posted in its entirety at the end of this page. The scuffle was also caught on video. 4. Matthew Price, “Bethlehem Christians flee tensions”, BBC News, 3 November 2006 . 8. Clyde Haberman, “Growing Power of Jerusalem's Ultra-Orthodox Makes Other Jews Uneasy”, New York Times, 19 July 1995. Aron Heller, “Israel's ultra-Orthodox suddenly are outsiders”, AP, 12 March 2013. 11. “Israel's chief rabbis back anti-abortion group: 'Killing fetuses is murder'”, Haaretz, 2 January 2013. 12. Greg Myre, “Israeli Riddle: Love Jerusalem, Hate Living There”, New York Times, 13 May 2007. 17. For instance, Capucci has held talks with the Iranian foreign minister in 1997 and the president of Syria in 2008. 18. “Meeting with Palestinian Authorities, Address of Pope Francis”, Bethlehem, 25 May 2014. The Fundamental Agreement was signed on Dec. 30, 1993, and came into force March 10, 1994. It was followed by the agreement on the recognition of the civil effects of ecclesiastical legal personality, signed on Nov. 10, 1997, which came into force on Feb. 3, 1999. 24. Daniel Estrin, “Vatican, Israel Spar Over Disputed Last Supper Site”, NPR, 5 April 2012. Associated Press, 9 November 2008. (AP) JERUSALEM – Israeli police rushed into one of Christianity's holiest churches Sunday and arrested two clergyman after an argument between monks erupted into a brawl next to the site of Jesus' tomb. The Greeks objected to the march without one of their monks present, fearing that otherwise, the procession would subvert their own claim to the Edicule — the ancient structure built on what is believed to be the tomb of Jesus — and give the Armenians a claim to the site. "We were keeping resistance so that the procession could not pass through ... and establish a right that they don't have," said a young Greek Orthodox monk with a cut next to his left eye. Father Pakrat of the Armenian Patriarchate said the Greek demand was "against the status quo arrangement and against the internal arrangement of the Holy Sepulcher." He said the Greeks attacked first.